"Mae was such a giving and dynamic woman. She will..."
"Mrs Belton was a beautiful lady. I enjoyed caring for her..."
"I met Mae and her daughter for the first and only time at..."
"Mae was a strong and welcoming woman and a shining example..."
"I consider myself blessed for having known Mae. She was..."
A compassionate life of service ebbed to a close on Friday, September 7, 2018 when Mae E. Grayes-Belton made her earthly transition. Mae was born on June 17, 1941 in Polk County, Florida to the union of Freemon and Matilda Grayes. After completing her education in the Polk County Public School System, she graduated from Edward Waters College and Brewster-Duval School of Nursing in Jacksonville, Florida. As a registered nurse, she was licensed and practiced nursing in Florida, Georgia and Louisiana. Mae specialized in Psychiatric Nursing and throughout her career, she worked in both in-patient and out-patient facilities. She retired in 2009 from the Louisiana State Department of Health and Hospitals as a Medical Certification Program Manager. But, Mae believed that service transcended her professional milieu. 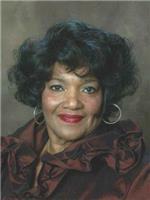 She had a long and impactful history of civic and religious involvement in the Baton Rouge community and beyond. She served as chair of the Baton Rouge Symphony Board of Directors, as well as past president of the Audubon Girl Scout Council and the Baton Rouge chapter of Jack and Jill of America, Inc. Other boards included the Louisiana United Methodist Foundation, Louisiana United Methodist Board of Pensions, the Woman's Club, and Cenikor Foundation. She was a founding member of the Beta Mu Chapter of Lambda Pi Alpha professional nursing sorority, an active member of Delta Sigma Theta Sorority, Inc. and also a track and field official at Louisiana State University for more than 20 years. Mae was a loyal and dedicated member of First United Methodist Church for more than 27 years and was involved at every level of the church's activities. She has participated in medical, construction and education missions to countries around the globe: Mexico, India, Kenya, Cambodia, Senegal West Africa, Tonga, Fiji and Brazil. Mae's tireless volunteer work garnered many honors and awards, including recognition from the Speech and Hearing Foundation, Cenikor Community Leader of the Year, First United Methodist Service Award, Baton Rouge Symphony Chair Award, a recipient of an award from the Girl Scouts of East Louisiana and the Women of Excellence Award from the Baton Rouge Chapter National Alumnae Association of Spelman College. Mae was preceded in death by her parents, Freemon and Matilda Grayes, and her first husband, Rev. Dr. George W. C. Calvin, Sr. She leave to celebrate her memory: her husband, Dr. Wesley J. Belton; her children, Charlotte Denise Calvin (Hayes) of Fort Worth, TX; Bertina Calvin-Jackson (Stephen) of Greenbelt, MD; and George W. C. Calvin, II (Leanne) of Menlo Park, CA; three grandsons: Weldon Howard, George Calvin, III, and Jordan Jackson. Sisters and brothers: Ozzie Grayes Mitchell (Alphonso); Rosia Grayes Perdue; Ben David Grayes; Freemon Grayes, Jr. (Georgia); Cora Mury (Tim); Richard Grayes; Willie Lee Grayes; James Edward Grayes; Robert Grayes; Bobby One Grayes (Fayreona); Glenda Waters; Angela Grayes and a host of nieces, nephews, other relatives and friends whose lives she touched so indelibly. Visitation will be Friday, September 14, 2018 at Rabenhorst Funeral Home Downtown, 825 Government St., Baton Rouge, LA, from 5:00pm until 8:00pm. Visitation will resume on Saturday, September 15, 2018 at First United Methodist Church, 930 North Blvd., Baton Rouge, from 10:00 am until a funeral service at 11:00. There will be an Omega Omega Service by Delta Sigma Theta Sorority at 9:30 a.m. Interment will follow at Roselawn Memorial Park.